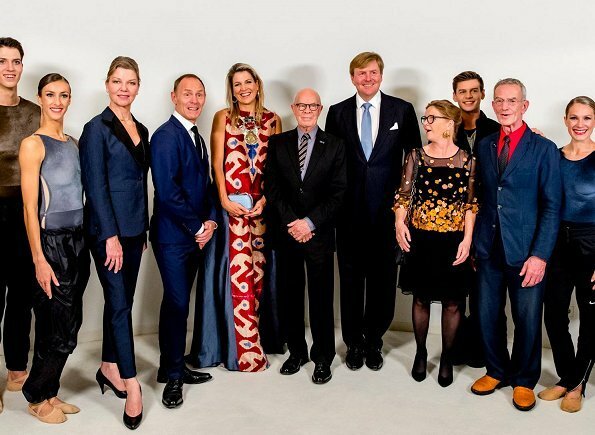 In the evening of September 15, King Willem-Alexander and Queen Maxima attended the premiere of the ballet performance 'Ode to the Master' at the Dutch National Opera & Ballet in Amsterdam. The National ballet brings a tribute to the permanent choreographer Hans van Manen, on the occasion of his 85th birthday. I´m puzzled, appalled and amazed by that outfit, all at the same time. Puzzled because I wonder if it actually is a garment and meant to be worn? Appalled because that is the most ill-fitting item I´ve seen in a while, with two main elements that look totally jarring together, a necklace (?) that looks like a warrior´s armour, and a hairstyle that is an insult to any official function. The bold design looks Pre-Colombian--South American. I think it actually would have been better without the weird blue drapery dragging it down. Maxima's fashion is not for the timid. Do I like it? No. Is she focus of the sartorial show? Yes. Back to unkempt, horrible hair, and less than attractive clothes. Where does she find such ugly things? Wow! Spectacular! Maxima is a fashion goddess! Absolutely fabulous dress, shoes, jewelry and purse! I like the dress itself very much - it's dramatic and fun and very Maxima. I do like the shoes but I'm not convinced by them with this dress. The necklace/bib thing doesn't go and looks like it was made by a toddler during craft session at nursery. The hair just makes me sigh - it looks like she just got out of the shower. She needs about 6 inches lopping off, a break from the bleach and several deep conditioning treatments. I tried to look more closely at that "necklace" and all I can see in a close-up is a doughnut, a cookie, and an apple with an odd pretzel at the bottom. Whatever is on the top is a mystery. One of the worst outfits Maxima has ever had. hahaha!! she's incredibly unpredictable! Only she can do this! and get away with it.lol. This is an amazing outfit. It just fits this Queen. The sandals are gorgeous! Just something totally different and it looks like the King can't keep his eyes off his wife. He thinks she looks stunning. Wow! There is enough material in this garment for a family tent. Not a winner as far as I am concerned. 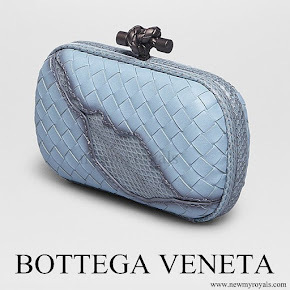 Gorgeous blue, but the print leaves me cold. Unique! You girls have said it all on both sides - and both are right. She continues to surprise, delight and horrify all at the same time. It takes great courage to be Maxima, and great confidence. It's a definite "No!" for all the reasons already given. 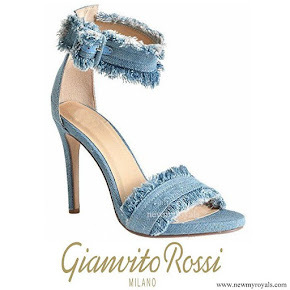 Question: how can the shoes be identified when they are not visible, yet the "dress", which is blinding us, is not identified by designer? And I wish she would stop carrying around that blah shawl (which never matches her outfit) to every event. Surely she has an aide somewhere who can give it to her if she gets cold - or she should dress for what temperature she expects it to be, as the rest of us do. Maxima needs such unusual choices what concerns her clothes choices, with anything less she would be bored. And I like her for that. This dress confirms that and she knows how to wear it. Such a pitty that her hair is in bad shape. Whoa, she pulled out all the stops. Rainbows of color and textures. How fun is she? Opening ballet season and the end of her summer and start of official duties. She's started out with a bang. I love it. How awful to be boring and dull or predictable? Fashion forward, thanks Queen Maxima, we only live once. 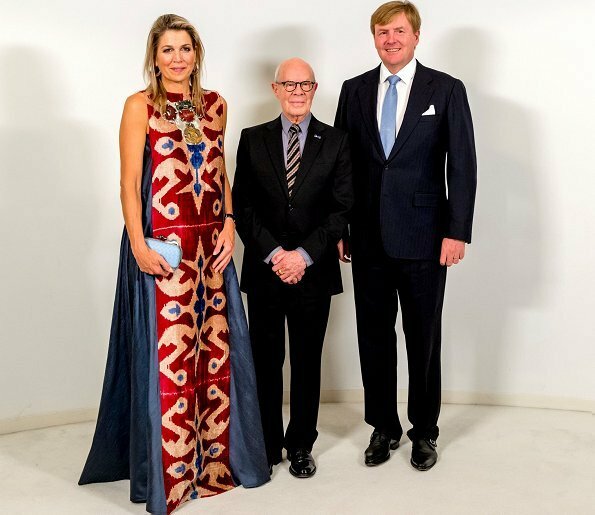 One can at least not accuse queen Maxima of being shy or stuck in a rut when it comes to her fashion choices. If I should say something positive of this particular outfit though, I would have to use the word Interesting. Ridiculous. Always want to be in the spotlight, sometimes it works, not this time. So much effort for dress, shoes, purse and the the hair, always her hair looks so messy, why?? Maxima should stop trying to be blond. She is not. Decades of hair lightening, even if only highlights, is very damaging. Her natural darker color at her roots is perfectly fine. And get a good cut, similar to Mathilde, perhaps. That's True. Shè dresses tot much like a moviestar. Once more Maxima makes me feel so strange ..... Her outfit so unusual .. I am wondering... Do I like it or not ??? No ... I don't like it at all !! Her hair ... once more so messy ... Her look reminds me a movie star and not a queen !! Perhaps she never had the sense of elegance !!!!!! So sad for a young woman and queen !!! So much money to buy the outfit and it looks like a clown..OMW.. It can't be easy to be a public figure while mourning the loss of one's parent. Give her a pass on the hair. The photos do raise questions. What kind of fabric is that front panel, the front panel and the sides appear to be different weight fabrics and its not working as well as someone thought it would. It is all about fashion here & a little bit Sinatra. Maxima does it her way. She is the influencer Queen and I am glad for it! Well, monarchy has to move to this century. Or so they say. Don't ask 'who's they'. I wouldn't be able to point out. So Wilhelm Alexander chose Maxima to be his queen, knowing very well what he feels and the life in the spotlight she will have to live. If he is fine with the lady dressed as she is by his side (although I often wonder if he really is; if he isn't, he sure plays the part well), who am I to judge her? Certainly this particular outfit isn't your 'safe bet', and I can't help but ponder around a question that I often ask myself when I see Maxima: is she maybe very shy and then this is her way of hiding behind her clothes?